Bighorn Sheep Hunts - Only 2 Spots Left! 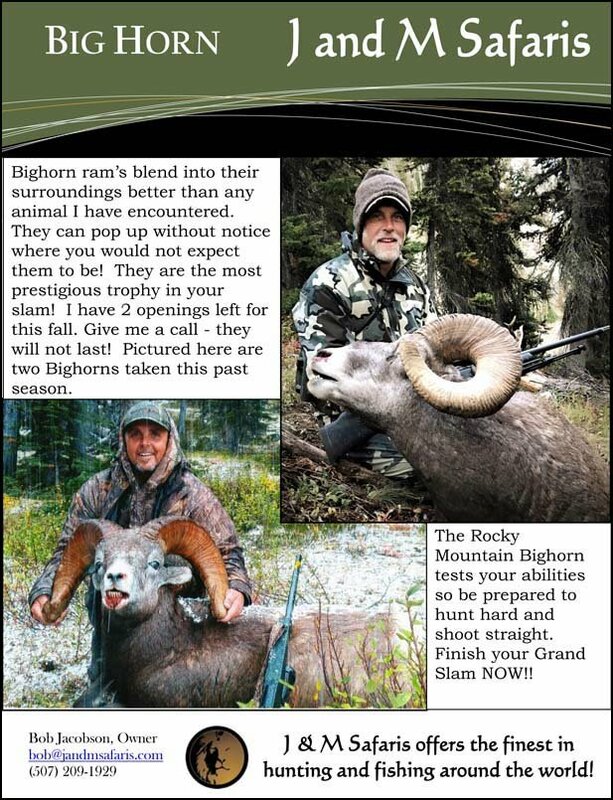 Bob Jacobson, at J & M Safaris, has two spots available for Rocky Mountain Bighorn Sheep. If you've been thinking of a hunt like this, get in touch with Bob and chat with him about the hunt and how he can help you out. 1. "RE: Bighorn Sheep Hunts - Only 2 Spots Left!" 2. "RE: Bighorn Sheep Hunts - Only 2 Spots Left!" Give Bob a call or shoot him an email. Let him know you saw the ad here and ask him all the questions you need to. I don�t know the price. Sorry.